Does Manuel Valera ever get tired? If the pace of his releasing new music, or joining another artist’s session, is any indication, the answer to that is an emphatic no. Six albums of his own in just four years, not counting other projects. And he’s done them in various configurations: solo piano, his groups New Cuban Express and Groove Square. 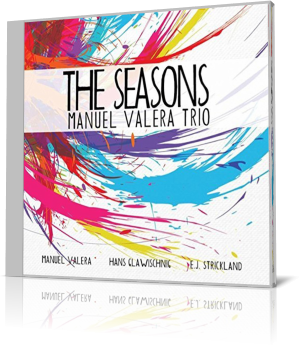 Now, in trio format, he presents The Seasons (Mavo Records, 2017). Accompanists are Hans Glawischnig, bass; and E.J. Strickland, drums. “Opening” and “In the Eye of the Beholder” get the show going in grand fashion. These two originals showcase Valera’s skill as both a performer and a composer. And while the piano is dominant throughout, bass and drums remain locked in, at times showing off a bit, but without distracting from the leader. Stellar trio play, indeed. “Hopeful” has a haunting, symphonic jazz feel. Inspired by Antonio Vivaldi’s baroque masterpiece of the same name, “The Seasons” is a four-part suite. Valera musically represents birth, development, aging and perishing. The tracks are progressive, moody, adventurous. Valera is a native of Havana, Cuba. The Grammy nominated artist has been a fixture in New York City for many years. He has collaborated with an array of luminaries, including Arturo Sandoval, Paquito D’Rivera, Dafnis Prieto, Jeff “Tain” Watts, Chris Potter, Mark Turner, David Binney, Joel Frahm and many more. In addition to his own compositions, Valera tackles selections by Cole Porter, Leonard Cohen, the Beatles and Osvaldo Farres. If recent history holds true, Valera will be back at it, working on his next release, before The Seasons complete their cycle.